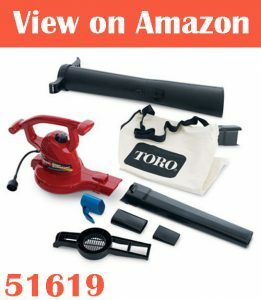 If you are on the market for either a leaf blower and or vacuum, then you have no doubt come across the Toro range of products. A couple of there more popular products being the Toro 51619 and the Toro 51621. Both of which are well rated and liked amongst almost all of their customers. But the question I want to answer today is which is the better option between them and which should you opt for depending on your own needs and budget. Below I will cover the differences and the similarities between the 2 models. When it comes to the overall build quality and durability of the 2 they are both almost identical. Both of them are excellent quality and both feel well made and sturdy. Both of them are made from metal unlike the cheaper options. Though don’t be concerned about the weight of the metal as it is quite lightweight and easy to use for each. When it comes to operation both are basically the same. They are both relatively lightweight and are easy to hold and carry around. Both have variable speed control to adjust as you like. The maximum air speed for both is 250 mph. As you may have already guessed both of them have the same air volume for the vacuum mode and both use the same motor which is 12 amps. There is a statistic which Toro use which is called leaf reduction which basically means the percentage of the debris which has been reduced to less than 50%. Basically, in simple terms the higher the percentage the more of the leaves it can clear. The difference between the 2 here is 88% percent for the 51619 and 97% for the 51621. In real world usage I really didn’t notice any difference between the 2 options. Both units come with a power insert and also a concentrator included though the 51621 comes with an oscillating nozzle and a shred ring which aren’t included with the 51619. The difference with the shredding ring basically equates to the leaves being shredded more finely – which in turn means you can get more leaves into a bag than the less fine shredding’s without the shredding ring. As for the oscillating nozzle it basically helps shake the leaves lose along with the high air flow which basically helps grab any leaves that may have been stuck than without it so overall its quite a nice addition to have. The 51619 is the cheaper model than the 51621. Both options are good value for money but of course the 51619 is clearly the best value. 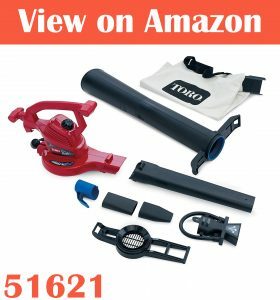 Both of these do exactly what you want from a leaf blower/shredder/vacuum – they have all the functionality you would want from this kind of device while being well made and durable and generally built to last. The 51621 is basically the plus version to the 51619 – it comes with the couple of additional attachments which in fact are quite useful – though for general usage both options are great. I would say if the additional attachments don’t interest you should of course opt for the 51619, not only is it quite cheaper but it functions the same as the 51621 just without the attachments really.